The Insights for ArcGIS interface can host all data—from enterprise data warehouses, ArcGIS data, geodatabases, spreadsheets, and big data. Redlands, California—Attendees of the Esri User Conference are among the first to experience Insights for ArcGIS, a data analysis application that marks a milestone in the evolution of GIS. 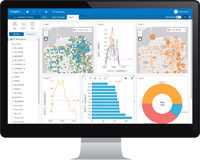 The Insights for ArcGIS interface can host all data—from enterprise data warehouses, ArcGIS data, geodatabases, spreadsheets, and big data. Users can add anything they need from Esri’s authoritative global data including the curated and authoritative Living Atlas of the World. By including a wider variety of information in analysis, users can now find answers to questions that they previously couldn’t even think to ask. Then, see those answers in the form of connected charts, graphs, and maps. Insights for ArcGIS features drag-and-drop controls and a clean interface for the most widely used GIS analysis tools. It’s designed to make it easy for users to analyze data and immediately find patterns, gain situational awareness, and explore what-if scenarios. Because Insights for ArcGIS is integrated with the ArcGIS platform users can quickly share analysis and allow secure, controlled access to anyone and everyone who needs it. Attendees of the Esri User Conference can see live demos and get hands-on experience with Insights for ArcGIS along with hundreds of other solutions designed to enable a smarter world. This annual event attracts 16,000 GIS users, managers and developers. It offers 300 moderated sessions, 450 hours of technical training, access to 300 software vendors, inspirational keynotes, and one-on-one sessions with Esri technical and professional support staff. Learn more and sign up for the upcoming Beta for Insights for ArcGIS.